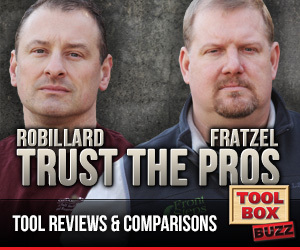 We get lots of comments and questions from our audience about who makes the best tools. 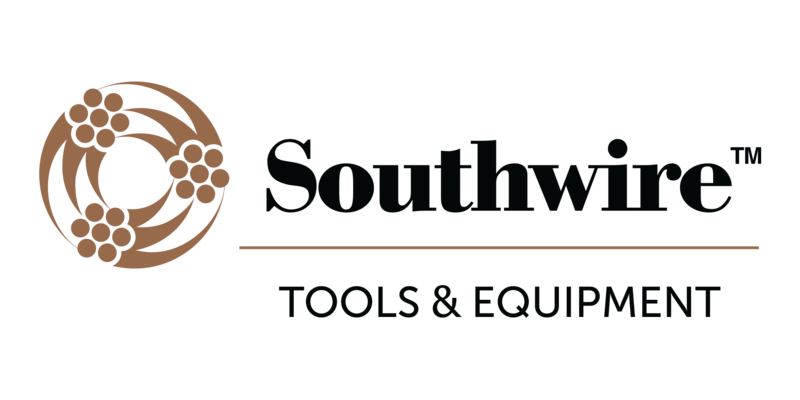 However, from our perspective a $300 power tool is just an expensive “accessory-holder.” Power tool accessories are an important consideration for all workers in the trades. 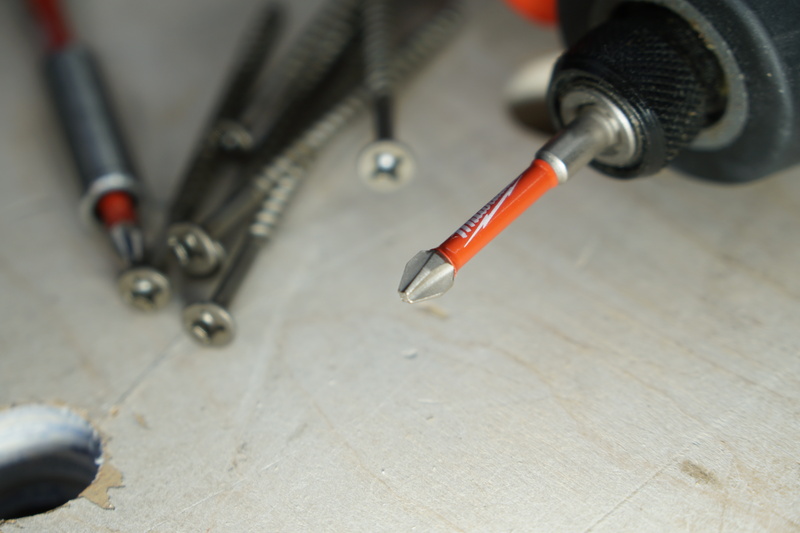 High-quality power tool accessories such as drill bits, router bits and saw blades are critical for optimal tool function and productivity. 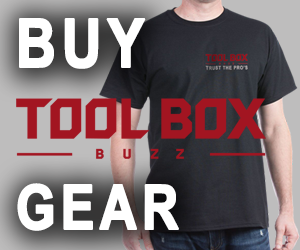 As a remodeler and General Contractor I can tell you that by the time my power tool dies and needs to be replaced I’ve spent as much or more than the tool cost in disposable accessories. We all recognize this yet many contractors, pay little attention to the accessories they use. 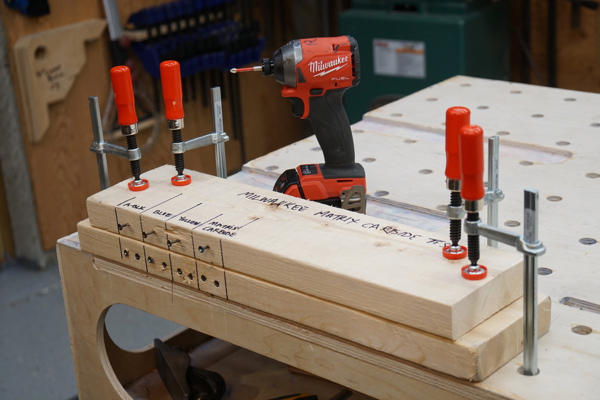 One accessory that most of us take for granted are bits for our drill and impact drivers. 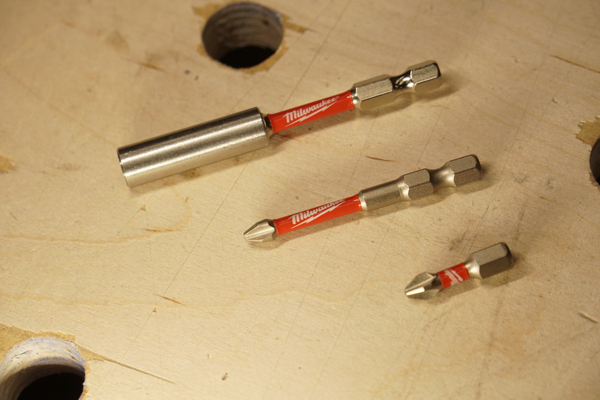 We just got our hands on a brand new type of bit from Milwaukee that we think is sure to change our expectation about how well a bit performs and lasts. 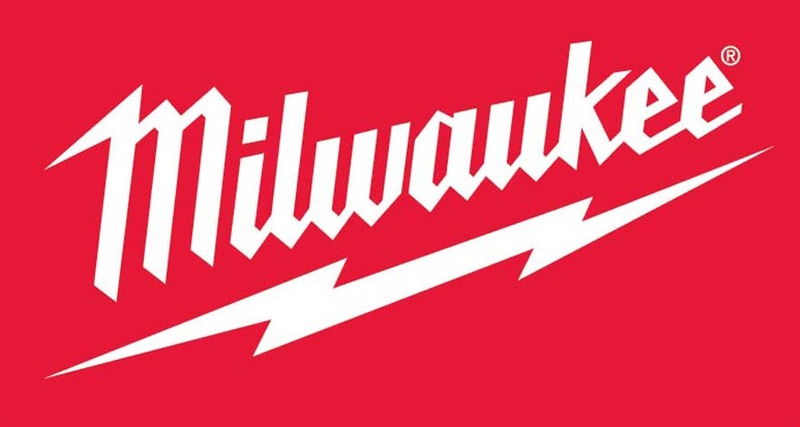 Milwaukee Tool is releasing a new addition to their Shockwave line. This upgrade is a new line of impact driver bits and are engineered to extend bit life, ensuring users that they will continue to be able to drive fasteners long after all other bits have failed. 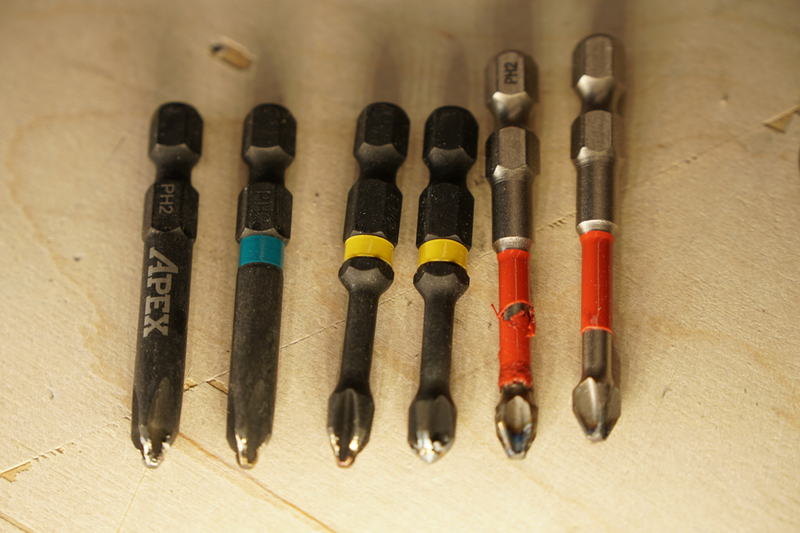 Even newer “impact rated” bits can wear out over time and lose their grip. The tips can get rounded over, broken, and worn down to the point that they start contributing to stripped fasteners. 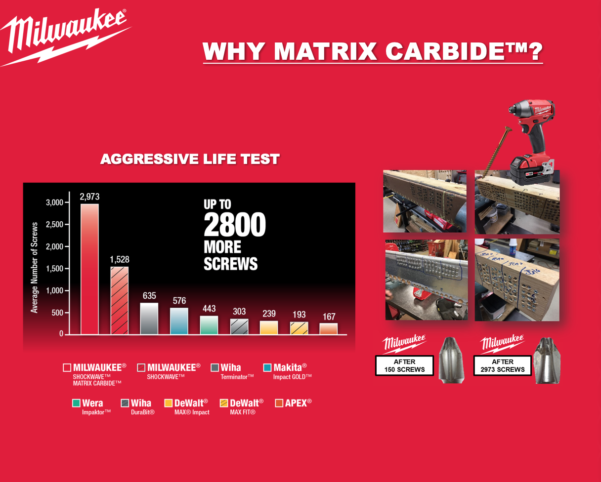 The new MATRIX CARBIDE Impact Driver Bits are designed to last longer and provide a much stronger impact resistant design. All the bits feature Shockzone™ geometry, in varying lengths and thicknesses, to absorb peak torque and prevent breaking. Milwaukee stopped into my shop the other day to show me these new bits. Allie Jensen, Product Manager for Milwaukee Tool took me thru a quick demo on the bits and let me try them for myself. According to Allie, “These bits will drive up to 2800 more screws than other premium driver bits.” I was skeptical so I asked to try it myself. Seeing is believing. To compare this new bit to a standard impact bit we set up a demo where we purposely stripped out a screw. I started with a competitor’s bit, set my impact driver on high, then rotated the impact driver tip and intentionally used the bit to strip the screw head. I continued to do this until the bit and screw head were shooting sparks. This completely wore off the bit head to the point that I was UNABLE to drive any other screws. Next I performed the same procedure with the Shockwave Matrix Carbide bit. In fact, I did it even longer until the bit tip was glowing red and some flames were seen on the tip. After stopping I did noticed some wear on the tip but it did NOT stop me from driving additional screws. So what’s the secret sauce? Its Carbide. The bits are engineered with a new MATRIX CARBIDE Steel(tm) that offers extreme wear resistance while still maintaining impact durability. 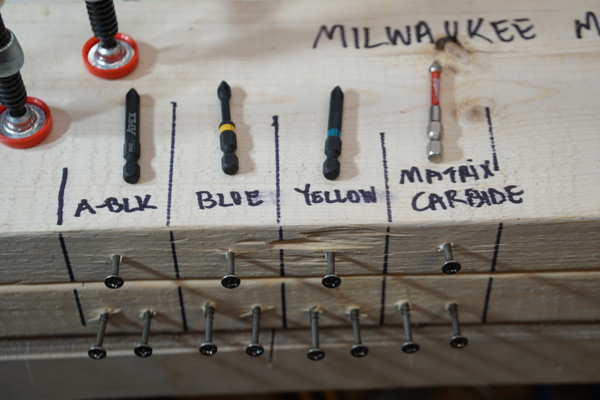 Milwaukee claims these bits will drive up to 2800 more screws than premium competitive bits. They’re so sure of this new line of premium driver bits that they are backed by a Lifetime Tip Warranty. You’ll also notice that the bit shank is thinner than the rest of the bit, that’s what they call “Shockzone™.” While this may look like a weak spot, it’s not, this shank has been optimized to absorb peak torque and prevent the bit from breaking. 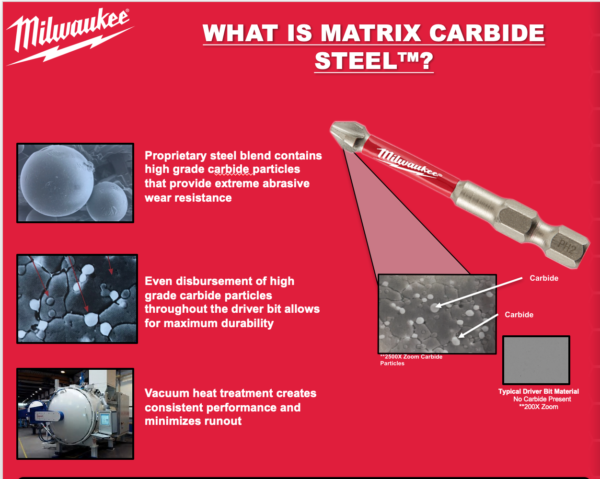 SHOCKWAVE™ MATRIX CARBIDE – Who Benefits? Retail on bit holder and 3piece set its $9.99. $4.99 for 1” 2 packs.